When it comes to exfoliating, I have a bit of an addiction. I love face scrubs, body scrubs, sugar scrubs, you name it. I just love how fresh and smooth my skin feels after exfoliating. Keeping in mind that you shouldn't use any kind of harsh scrubs on a daily basis, I look for ways to gently exfoliate my skin that are gentle, yet effective. 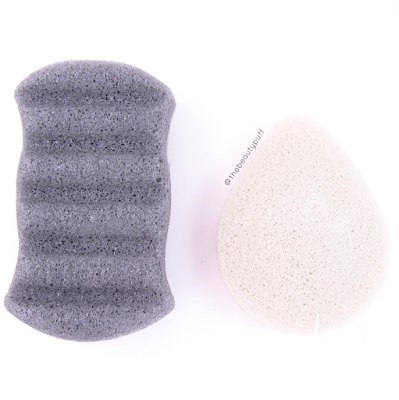 My Konjac Sponge has a wide variety of sponges, for face and body, to suit this purpose. The two sponges I have are the French Green Clay Facial Sponge and the Bamboo Charcoal Body Sponge. So how do you use a Konjac Sponge? You simply saturate the entire sponge with water and gently squeeze out the excess. You will know the sponge is fully saturated when it is completely soft. When you squeeze out the water, be careful not to wring it, as this will shorten the life of your sponge. You can use the sponge with or without cleanser, just be sure to rinse it out completely before letting it dry in a well-ventilated area. You should replace your sponge about every few months, unless you notice it breaking before then. If you want to sanitize your sponge (recommended every two weeks), simply place in a bowl of water and put in microwave for about a minute and a half. This particular sponge is geared toward those with normal/combination skin. This time of year, my oily skin becomes a bit more combination. It is still acne prone, but this sponge has that all covered! French Green Clay absorbs the dirt and bacteria that can cause breakouts and it also takes care of pesky oily that plagues my skin all through the year. I have been using this sponge without cleanser because it feels like a mini massage all on its own. It's much larger than other sponges I have used so it's very efficient and comfortable to hold. The smaller side easily fits around my nose and around the eye area, while the larger side takes care of larger areas like my cheeks and forehead. You can hold the sponge however you like, I just try to rotate it so it gets even wear. My skin has been considerably smoother since using this sponge. It takes care of any little dry patches and preps my skin for serums, moisturizers, or whatever the day may bring. Since it helps my skin absorb products so well, they can work better and more efficiently. I love using it right after I shower to start my day with a fresh face! As with the facial sponge, I use this sponge after I have cleansed so it can work its magic all on its own. The charcoal helps draw out oil and dirt that can cause breakouts, which is a bonus. The sponge itself is very soft, but still exfoliates well. It feels great especially after working out to rejuvenate skin. You may use more lotions and potions for your face, but the skin on your body needs exfoliation and moisture too! Using this sponge has really helped my body lotions sink in and absorb more quickly. It will definitely help improve my skin's condition in the winter when dry/itchy skin becomes daily occurrence. Once you are done using this sponge, rest it on something like a soap dish where air can circulate and dry it thoroughly before its next use. My Konjac Sponges sponges come in different varieties to suit different skin types. There are face sponges for normal, dry, sensitive, mature or oily skin. There is also a body sponge that is suitable for all skin types as well as a sponge sensitive enough for babies. 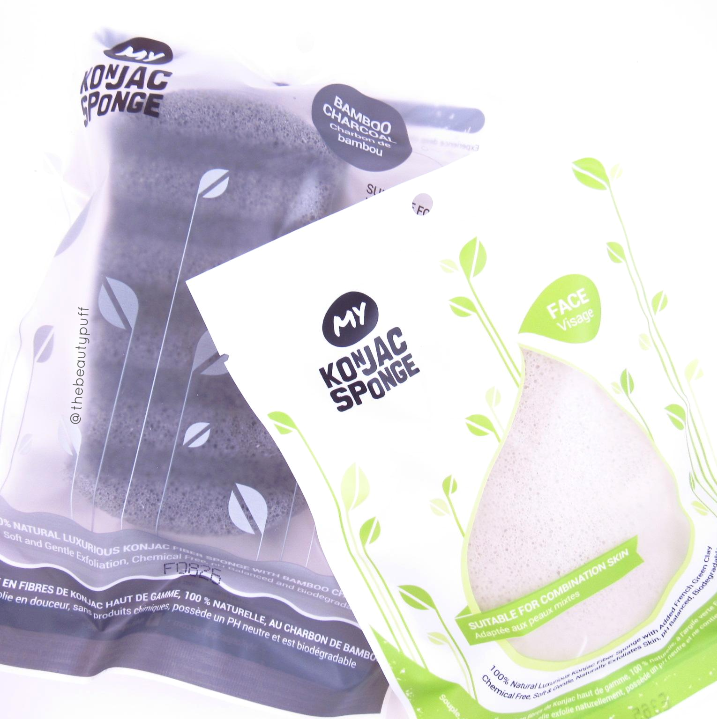 My Konjac Sponges are 100% natural, vegan, cruelty-free, biodegradable, and compostable!